Among the speakers were Interim Chancellor Steve Hansen, Venessa Brown, associate chancellor in the Office of Diversity and Inclusion, junior Ricky Rush, president of the Collegiate 100, and senior studio art major Kiarya Glover, whose work was on display. Free Black Heritage Month t-shirts also were distributed. 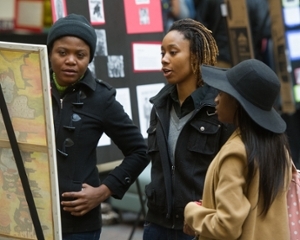 Photo (L-R): Nigerian graduate student Ololade Mustafa, vice president of the African Students Association; Kiarya Glover discussing her art work; and DeJanee Callahan, a freshman in applied communication studies.